Kranky reissue Liz Harris's classic record of beautified drone. Drone is nameless; nobody curates ambient. To go to a Sunn O))) gig is to get closer to the amplifier than Stephen O’Malley. The robes come with higher celebrity status, the loudness is more mythic. This is the underground digging deeper, conspiring to make music so spectral it's as if the person making it is passing through you. Drone merchants are no-names with more famous effect-pedals pressed against their feet. I celebrate drone and ambient because they tantalise me with all the reasons I can't take away; the movement is glacial, impossible at the wrong times, and when perfected, so relentless that words like making or composing would be scratches on a perfect landscape. A voice can change all that. Because of Liz Harris, someone on some godforsaken website inhabiting some corner of the internet felt compelled to say something I never did think I would hear, and something that characterises the empty landscape in front of us: "girls can drone too". As a well-intended sidebar on Harris's music – championing equality in the drone workplace, maybe – this comment works, but does this music ever meet its maker? What the comment really entails is more along the lines of anyone, anywhere, can drone – but it's a sad and lonely life. That should be plastered to every billboard the wrong side of town. In a way, though, I can see why that commenter got confused by what's behind Dragging a Dead Deer Up a Hill. There's no doubting this is a record with a human force behind it. It's more than just an album of droning guitar music because someone speaks to us. A voice carries us up the hill, but one so wistful, so beyond us that it may well be our siren song. We hear Harris up on high, her voice rarely changing key, sonorously singing a forty minute lullaby to keep us safe, or at least to keep us going. Harris is there on the hill even if what we're hearing is the sloshing water passing us by. Dead Deer does have a composer, but one driven by the elemental; she's surrounded by premonitions of a great storm, and her meditation on the flood is what really drives Dead Deer. The marriage of the album to its surrounding landscape is vital, but this is more than just a vision. Harris modulates the long journey of Dead Deer to her will, molding it into an album of faraway dream-pop, and most importantly, giving a song to the onslaught. The guitar picking of "Travelling Through a Sea" is mesmerising, its changes more so. We'll always hear the endless motion in this record, and what the Grouper project is, but Harris made Dead Deer beautiful by putting a person on the other side. This isn't the empty landscape we assumed, and when the storm passes, we all go to sleep. The first sound on Dead Deer is of a windstorm, one "Disengaged" endures for the harshest minute of noise on any Grouper record. The importance is in the retreat; instead of staying out longer, Dead Deer chronicles things from the window. You can't mistake the enormity of what Harris is conveying – she reacts to tidal waves and heavy flowing water, or to being stuck in the middle – but her response is to let it pass over her. 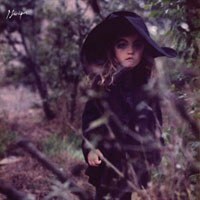 On "Heavy Water/I'd Rather Be Sleeping", one of the record's most crystallising moments (and, miraculously, the piece that broke big for Grouper) she trades in the storm's nervous energies: "I'm moving through heavy water / this love is enormous / it's lifting me up". Dead Deer is underneath and surrounded, the perfect "rain album" because it is chronicles the intrusion Harris is feeling. More than that, it's a physical album, one that has us dragging ourselves; we are having this journey. Liz Harris is a wizard cast over. Stephen O'Malley wears the robes, but Harris has the spells. She's another nameless, and if I envision her, it's in the vein of this great conjurer. There's no other album that elicits the feelings of Dead Deer, which makes her the occupant of a realm where no other can go – the sole occupant, separate even from the Harris who wrote Way Their Crept or the far more ambient A I A collection. Now we have The Man Who Died in His Boat, a companion piece for Dead Deer that only serves to reveal how singular that time of Grouper was. Harris could never get this back, and like a marker in the sand, its place in time shows; the other-worldly sounds of her guitar, creaking like rusty steel against a trial of elements, stay for as long as the storm does. What Harris conjured up was the image of this disastrous storm and the instant of her retreat. There's no doubting what Harris battled against on Dead Deer because it was there for a moment, and then it was gone. This year, we've seen reissues make significance of time. Fleetwood Mac's Rumours, a record that lives and breathes its own history, barely feels the product of 1977 anymore; it has divorce written on it the same way Blood on the Tracks does, as something that belongs more to the song than the story itself. We've seen thirteen-year old Voodoo get exalted to a higher plane with its first vinyl edition, which says as much about its vitality; it simply gets to emerge again, this time pre-emptively triumphant. Pieces are written on Mac's broad, musical history and some feeling of necessity brought about another reason to celebrate D'Angelo. For Dead Deer, though, the Grouper name got shrouded. The only reason it exists again is because it went out of print too quickly, existing all this time for internet dwellers and those already dedicated to drone and ambient, genres that already don't grant much history to those behind them. But I like to think over these five years, Dead Deer has become its own timeless gem, regardless of who's listening to it. It seems like it's always existed, this record, Harris conjoined to her sleepy apocalypse forever. It's only five years old, but that doesn't matter – nothing will ever sound like this again.